This summer I went to the Three Rivers Arts Festival in Downtown Pittsburgh. The festival took place June 1-10, which is the same time as Pride events. This year I did what I did last year, my first year living in Pittsburgh during the summer, and I went to both events. Pittsburgh Pride is an event that encourages LGBTQ+ individuals and people who support them to show their pride for the LGBTQ+ community. There’s always a march at the end of the week, with dancers, drummers, and regular people joining in. Both the Arts Festival and Pittsburgh Pride are always crowded, especially during Sunday, the last day for both events. For the Three River Arts Festival, I go there once the crowds for the Pride events are too overwhelming for me. The two festivals are a street away from each other so going to both is no issue. I think the best part about the arts festival is the atmosphere. The Pride atmosphere is overwhelming after a few hours; it’s very loud and colorful. The arts festival is calm and relaxing. The Point is at the end of the Three Rivers Arts Festival as well, which isn’t often filled with people. Going to the Point after the long day of celebrating to take a rest is really pleasant. There’s enough people there to make the space feel inviting but not so much that it’s loud. Art at the Three River Arts Festival is very mixed. There are a lot of different kinds of art made from different mediums. I think the most kind of art I saw were different household items and instruments made from wood around the entrance. Wooden cooking utensils and ceramic bowls and plates were rather abundant considering they made up about half of all the art. Vendors selling their paintings were mostly around all the food and the performers’ stage. I think the most interesting pieces I saw were paper cutting and record cutting. At one small booth a man was selling different paper cuttings. He had some premade that he brought but if you wanted, he could commission a paper cutting. I heard from a friend when she went to the festival the day before me that he saw this woman who said it was her birthday and made her something for free. She had given birth recently and really quickly he made a paper cut out of a pregnant woman. When you moved the arms, a baby would come out of the figure. My friend said she didn’t notice any sort of glue or anything, so he made the entire piece with cutting and folding paper. Another booth near the end of the festival had old records that had different figures or words cut out of them. The artist had heated a knife and used a hot knife to score where he wanted to cut into the record. While the material was still pliable, he used an x-acto knife to cut out pieces from the record. The process was probably rather tedious, since the material of the record probably cools pretty quickly. Most of what the artist was selling was preexisting popular logos and figures that would sell better than original artwork. There were portraits of famous people, mostly old rock stars, and logos of old rock bands cut from the records. I think his idea would be really cool for original artwork. The way that a design would have to be made reminds me of art I made in a printmaking course I took. For wood block printing, the design you make has to be simple, since you can’t easily create tones between the color of the paper and the color of the ink. For the record cutting, you can’t create tones between the shapes because you have to create the design from negative space, the space cut from the record. The different public art pieces at the festival are interesting along with the art being sold. 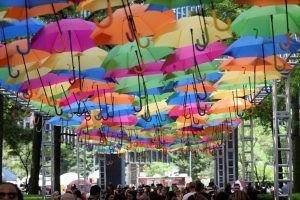 Last year there was a display of dozens of different colored umbrellas at the entrance of the festival. This year the umbrellas were taken down and the main walkway had signs the encouraged breastfeeding in public. The signs showed historical paintings with speech bubbles drawn by the people’s faces that said “Wow isn’t this a great place for breastfeeding?”. I’m not sure if the water’s dyed or it’s painted on the inside, but there’s a really beautiful fountain with the bluest water I’ve ever seen. Kylie Fletcher is a senior at Chatham, majoring in Media Arts: Graphic Design and Cultural Studies. Kylie works in the Office of International Affairs.